Selling digital goods and services is one of the smartest ways to make money online. Unlike selling physical products, there are no inventory costs or shipping costs involved. Plus, the options for digital products are virtually endless: videos, eBooks, music, audio files, PDFs, website themes & templates, WordPress plugins, development time, photography and much more. Companies like Selz, Shopify, and Esty allow new businesses to create a virtual online shop in minutes. The catch is many of these shopping platforms take a percentage of your sales or have monthly fees. That’s alright for someone just starting out, but the ones who are serious about selling online will want to create their own virtual store and cut out the middleman. Thankfully, with WordPress, creating an online store is incredibly simple and easy to do. So today we are going to dive into Easy Digital Downloads. We’ll show you some advantages to using it over WooCommerce and how to install it on your WordPress site. Recommended reading: WooCommerce vs Easy Digital Downloads: Which One Should You Use? Why Choose Easy Digital Downloads? There are numerous e-commerce plugins for WordPress, and two of the most popular ones you are probably familiar with are WooCommerce and Easy Digital Downloads. WooCommerce has over 1 million active installs and is used by loyal digital store owners around the globe. In fact, as of January 2018, WooCommerce powers over 35% of all online stores! And even though we love WooCommerce, that doesn’t mean it is always the right choice for your business or product. Easy Digital Downloads (EDD), created by Pippin Williamson, is a free WordPress e-commerce plugin that focuses purely on digital products. Its primary goal is to make selling digital products simple and complete. WooCommerce was actually originally created to handle physical products, although you can now use it for digital products as well. One great thing about Easy Digital Downloads is that it is fast right out of the box. 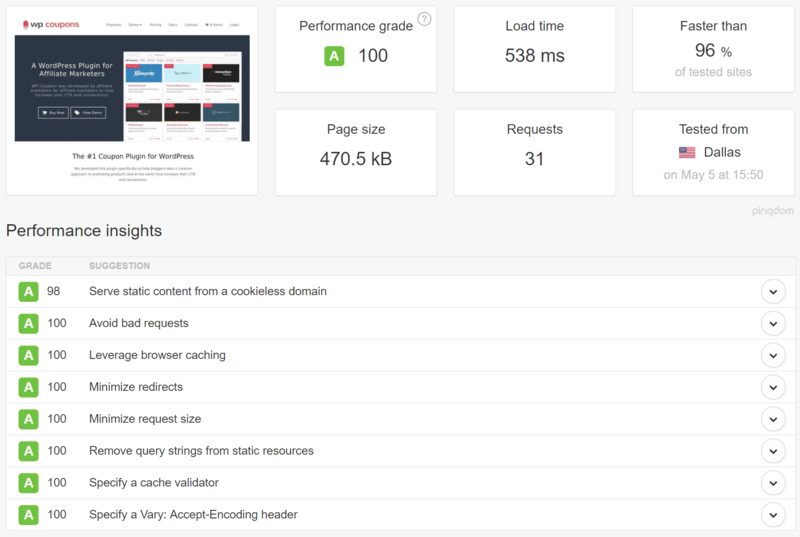 WooCommerce can be fast, but it takes some tweaking and if you are dealing with a lot of traffic you will most likely end up needing optimized WooCommerce hosting. 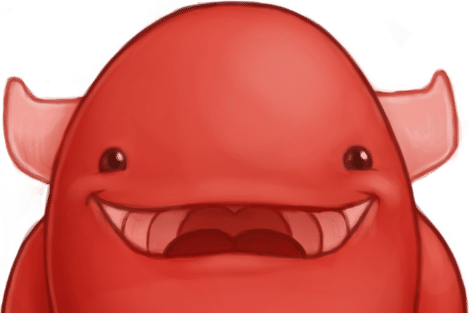 Here is an example of a live EDD shop running on Kinsta hosting. 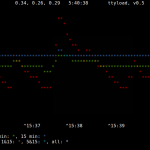 It loads in under 600 ms! The great thing about digital downloads and services is that a lot of times they won’t have huge catalogs of products bogging down their site. Typically they sell only a couple products or a single product with different license costs. Another huge benefit of Easy Digital Downloads from a user perspective is that it is very easy to use. You can have it up and running in a matter of minutes. Just add your payment details, create your digital products, and you’re pretty much all set. And just like WooCommerce, it has thousands of extensions and integrations which allow you to process credit card payments, handle reoccurring transactions, take advantage of affiliates, etc. It’s very versatile and provides you with an easy way to analyze and track your sales. It also has a great team behind it which is committed to WordPress coding standards, ensuring that making changes to the codebase is simple and easy. EDD currently has over 60,000 active installs and a 5 out of 5-star rating on the WordPress repository. This is very high for a WordPress plugin! Developers love it for its easy to use and well-documented hooks. We’re using EDD as a way to offer Support. Our service has a downloadable plugin each support customer must activate after they sign up with us. EDD allows us to rename the slug (products) and name it whatever we want. I love that hook! EDD allows us to overwrite templates in order to meet our demands. I love that EDD is easy to update. Nothing really to worry about. We still update in staging to be safe. EDD has a variety of support resources available. You can easily ask for help on the WordPress support forums. Pippin himself is actually very active on there. As of writing this, 30 out of 39 tickets had been marked solved over the last 2 months. They have helpful how-to videos, tutorials, and a very extensive and well-documented knowledgebase. Basic support is free, but you can also opt for priority support, which is either $39 per month, or $129 per year. EDD’s main selling point is the ease of selling digital downloads. The platform allows customers to purchase multiple products and at the same time have multiple files attached to them. Back-end users can easily bundle products together, and the plugin uses AJAX for a smooth shopping cart experience in the front end. Another outstanding feature is the ability to create discount and promotional codes. Discounts can be offered as a percentage of the base price and can have an auto-expiration date and a maximum use limit set. EDD offers three payment gateways by default (Paypal, Amazon, and manual) but many others are available as extensions. One of the best features EDD has to offer is their commitment to helping you deliver an outstanding customer experience. It has a built-in customer access area so customers can easily access the files they paid for and keep track of their purchases. If they ever accidentally lose/delete a file they downloaded, customers can log in to their account and re-download it. EDD offers a complete history of all sales, and detailed sales and earnings graphs. One particularly cool metric is the projected sales report which gives you an idea of the sales you can expect in the future based on your past performance. The ability to track best selling products and also find out what products are not selling helps business owners to find and exploit the products that are the most profitable. It allows you to focus on the areas of your business that have potential and revamp the rest. It will also work on any almost any WordPress theme. From our experience, this just isn’t the case with WooCommerce. Typically with WooCommerce theme developers need to do extra work to build in support. EDD is built a little differently and this makes it a perfect addition to whatever theme you already have installed. There are numerous EDD plugins available to purchase to further extend the platform. Some of them are created by the EDD developers, while others are sold by third parties. Stripe Payment Gateway: We are big fans of Stripe at Kinsta. Easily accept credit card payments and process them with the Stripe payment gateway extension without customers leaving your site. EDD Social Discounts: This extension lets users give their customers a discount if they share links to the product pages on social media. 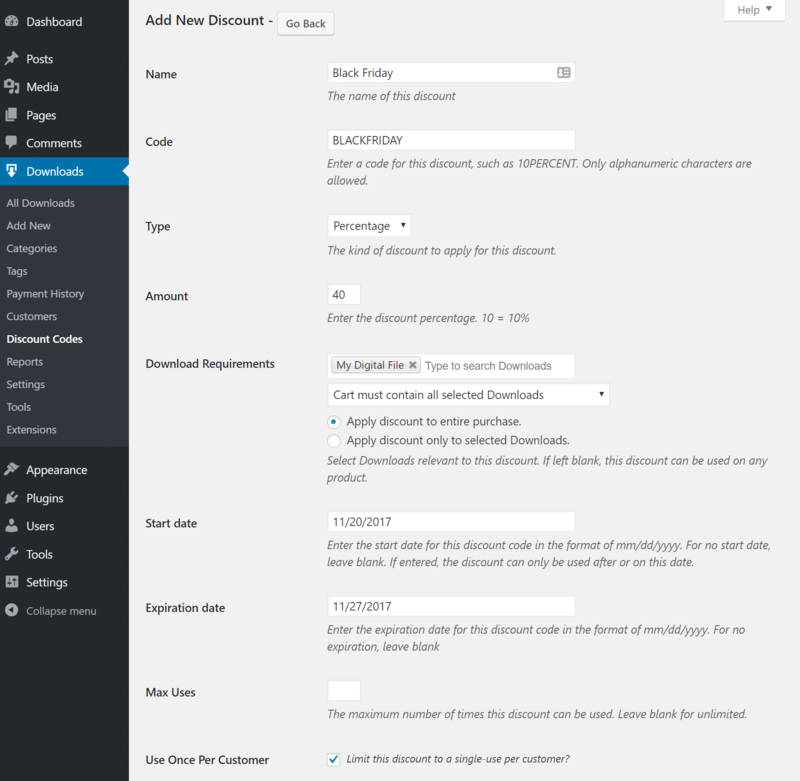 It also has the option of turning off the discount function and then it becomes a simple sharing tool. Mailchimp: This is an outstanding extension for email marketing purposes as it automatically subscribes customers to a Mailchimp mailing list. Subscriptions can be filtered according to the product purchased. If you’d like, the extension allows for customers to opt-in to the mailing list. Cross-Sell and Upsell: This marketing extension suggests additional products to customers during the checkout process. It can also give customers an upsell option, which suggests a similar but slightly higher valued product than they currently have in their cart. For example, products can be bundled into a package that includes that product, plus additional products. It’s a fantastic way to increase the order value per customer. EDD Variable Pricing Descriptions: This free extension allows users to add an “Option Description” input field for each variable priced download. It also lets users add a longer description and automatically places the description on the front end on the product page. WP Menu Cart: This free and simple plugin automatically installs a shopping cart button in a website’s navigation bar. It has several options, including the ability to display a cart icon or items/prices. There is also a premium version that has a few additional features. PixelYourSite: Manage and install the new Facebook pixel with just a few clicks. 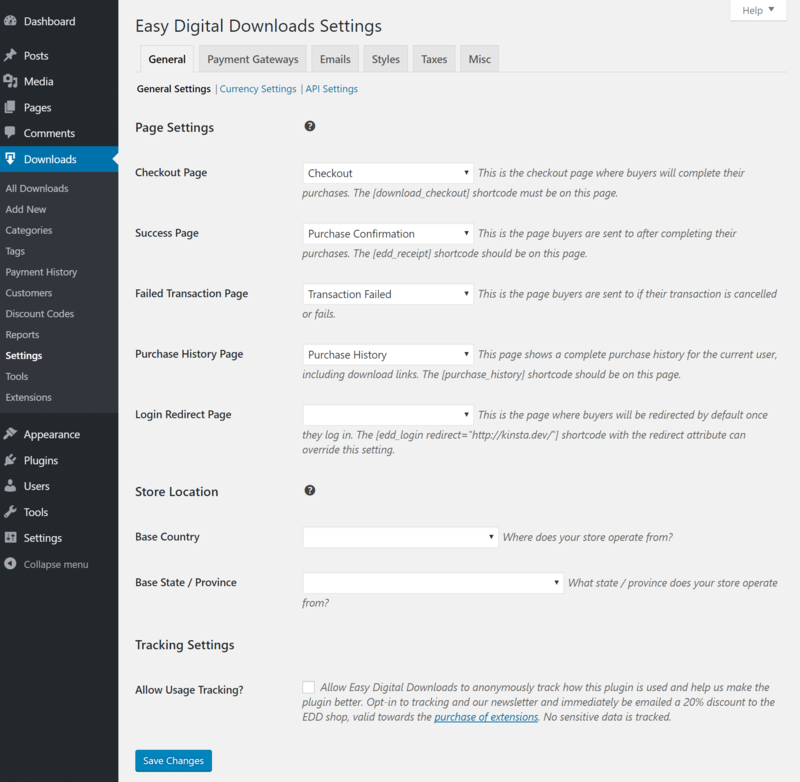 Check out our in-depth tutorial on how to set up conversion tracking in Easy Digital Downloads. 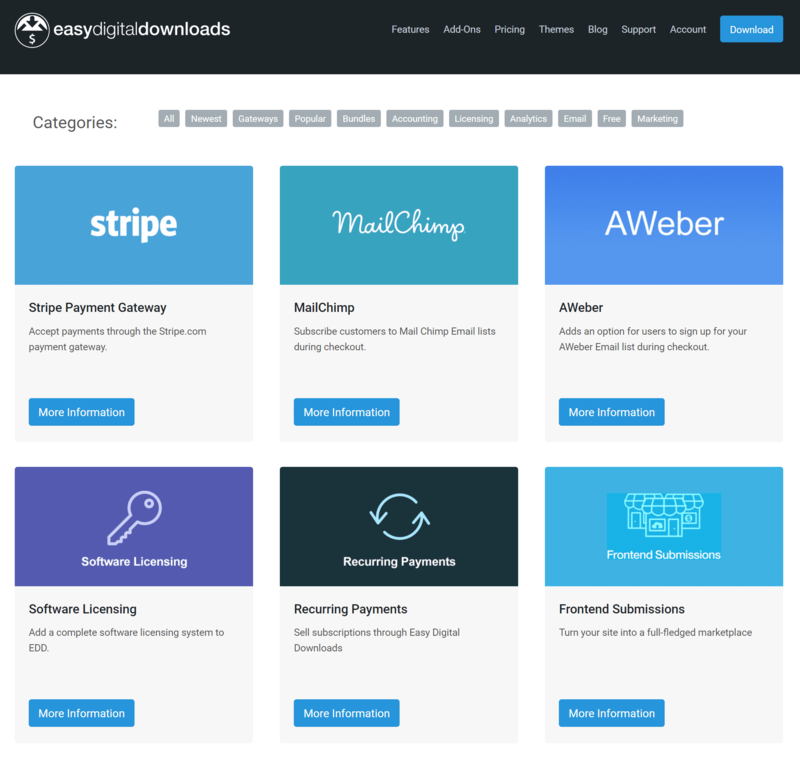 EDD Downloads as Services: This free plugin allows you to easily sell services rather than downloads. This is perfect for WordPress developers and freelancers. It removes the “no downloadable files” on the purchase confirmation page. EDD Software Licensing: If you sell digital products, such as WordPress plugins, that require license keys. This extension takes care of all of that for you. EDD Recurring Payments: This extension makes it easy to create and sell products with automatically recurring subscriptions. Posts Table Pro: Instantly list your Easy Digital Downloads products in a table view with extra data. This is a great way to improve on the default EDD layout and create a one-page order form listing some or all of your downloads. Password Protected Categories: If you want to hide parts or all your Easy Digital Downloads store, then this plugin makes it easy. Password protect entire download categories, or create private categories that only logged in users can see. The first thing you will need to do is to install the Easy Digital Downloads plugin. You can download it for free from the WordPress repository or follow the steps below on how to install it from within your dashboard. To install it from your dashboard navigate to WordPress Admin > Plugins > Add New, search for “easy digital downloads”, and click on “Install Now.” Ensure that the author shows up as Easy Digital Downloads. 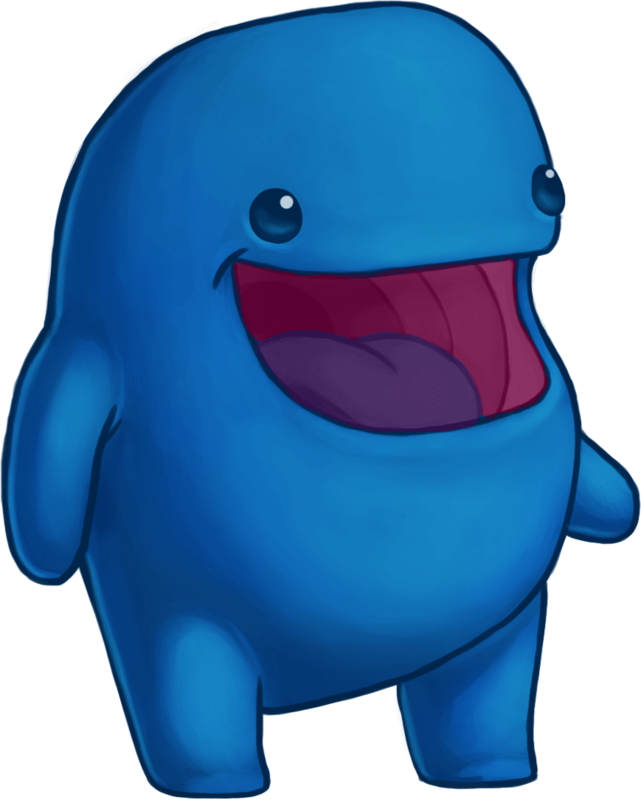 2.7+ is currently the latest version of EDD. And that’s it! Your all done. It really is that easy. There are no long walk through wizards. They keep it very simple. But there are some additional configuration options you will probably want to setup below. The first thing you will want to do is configure options for checkout, payment, redirects, etc. 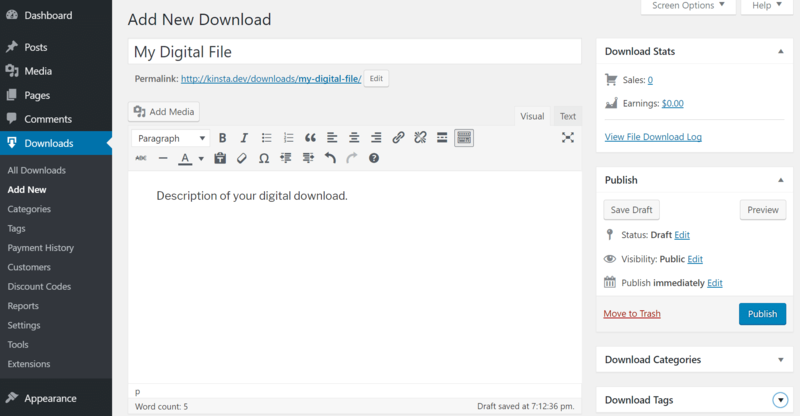 To do this, click into settings under “Downloads” which is now on the left-hand side of your WordPress dashboard. Next, click on the “Payment Gateways” tab. 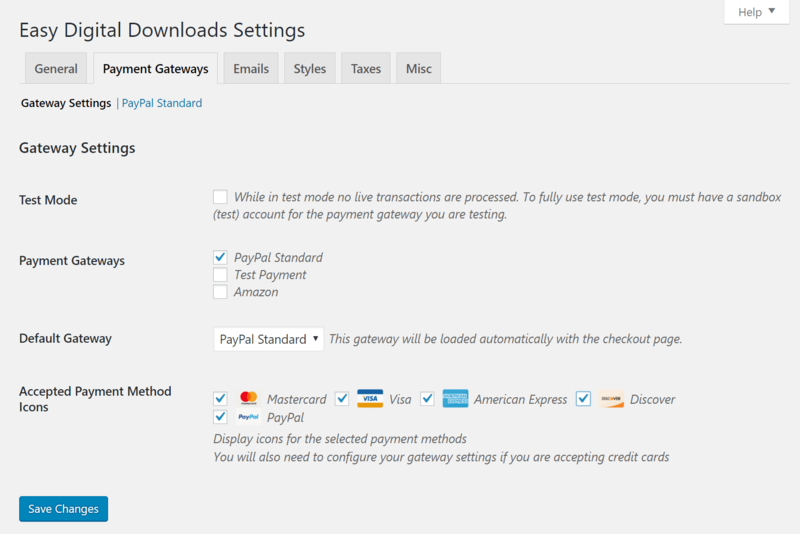 Here you can choose which payment gateways you want to use for processing transactions on your site. By default, PayPal standard, Amazon, and test payments are your choices. You can put your store into test mode which allows you to test purchases on your site without spending any actual real money. You will need to grab a free sandbox account (PayPal, Amazon Pay) to mimic real live payments. Remember, you can also purchase premium extensions to use other payment gateways such as Stripe, Braintree, Dwolla, GoCardless, etc. By default, PayPal standard will process transactions via their site. This means your customer will check out on your site, get posted to PayPal, and then get redirected back. If you want them to stay on your site, you can upgrade to PayPal Pro payments or use another provider like Stripe. Check out our in-depth tutorial on how to setup Stripe with Easy Digital Downloads. Next, click into the subheader “PayPal Standard.” If you are using PayPal you will want to at least put in your PayPal email. 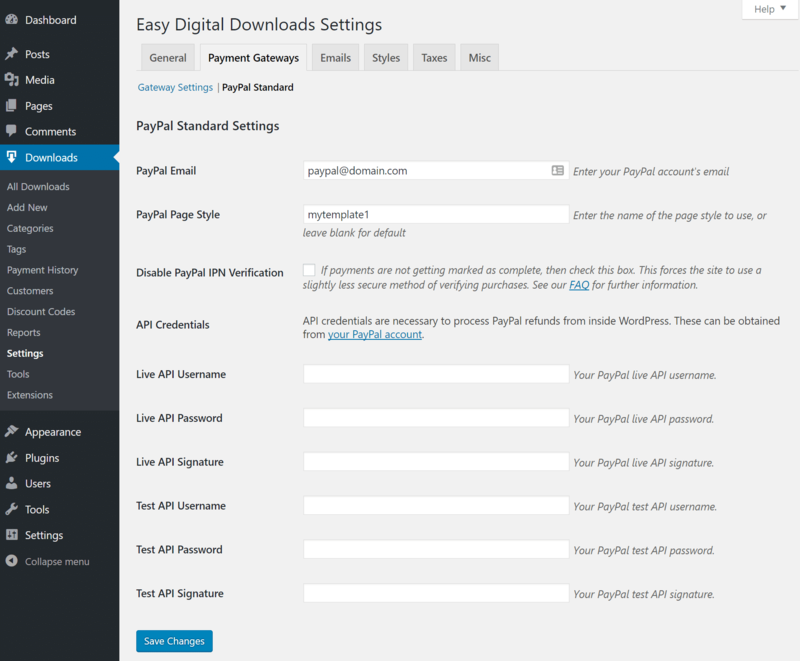 It will use PayPal’s default page style unless you specify one. Check out their documentation on how to create custom page styles for checkout. Even with the free version of PayPal, you can customize most of the customer’s experience with your own branding. Then click on the “Emails” tab. By default, everything is ready to. But you will want to at least set a logo for your store or product. Emails are automatically generated to administrators and customers. Here is an example of the default EDD email template that is sent to a customer, along with the logo. The email includes a link to your digital download file. If you are using an extension like EDD Software Licensing it will also automatically insert their unique license key. Immediately redirect to checkout after adding an item to the cart. Allow item quantities to be changed. Forcing a redirect to a secure checkout page. You must have an SSL certificate installed to use this option. Require that users be logged in to purchase files. Allow customers to use multiple discounts on the same purchase. File download limits, download link expirations, disable the ability to redownload files. Enabling an option for terms of agreement upon checkout. The next step is to add your digital downloadable files to your WordPress EDD store. Remember, depending on what extension you use, this could also be services offered instead of physical files. Click “Add New” under Downloads and name your digital file. 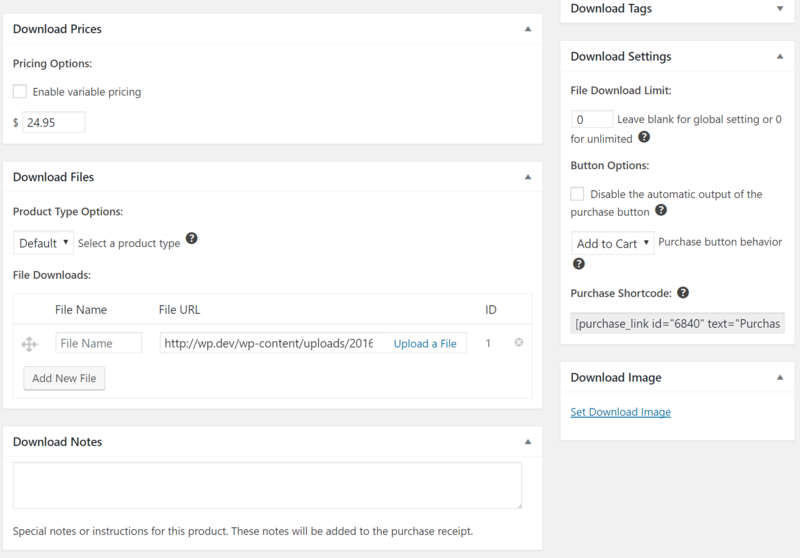 You can add a description (which shows up on the download file’s page to the customer), category, download tag, etc. Then give your download a price. Variable pricing is also available with a click of a button. You can then upload your digital file, whether it is a .zip, .pdf, .mp3, etc. The next step is to ensure that your folder where your digital download files are kept is secured. Otherwise, someone could just browse to the location and download the file for free. You will most likely see a warning about this on your WordPress site until you fix it: “Download Files Not Protected on NGINX.” This step is only required on NGINX, as for those running on Apache, a rule is automatically applied to your .htaccess file. To secure your directory, add the following to your NGINX config. Note: This example is for .zip files. Change accordingly for other file types. If you are a Kinsta user, you can open up a quick support ticket with our team and we will add this for you. After adding the above code, users that try to browse directly to your download file will simply be redirected to your homepage. The last step is to add a way for users to purchase the digital download files on your WordPress site. 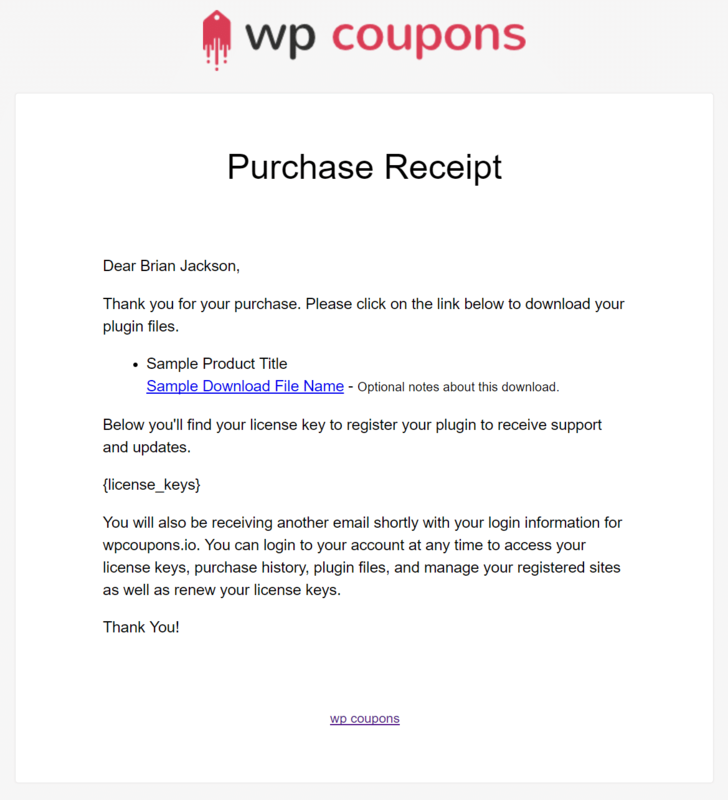 By default, each download will have its own WordPress page with a purchase button. 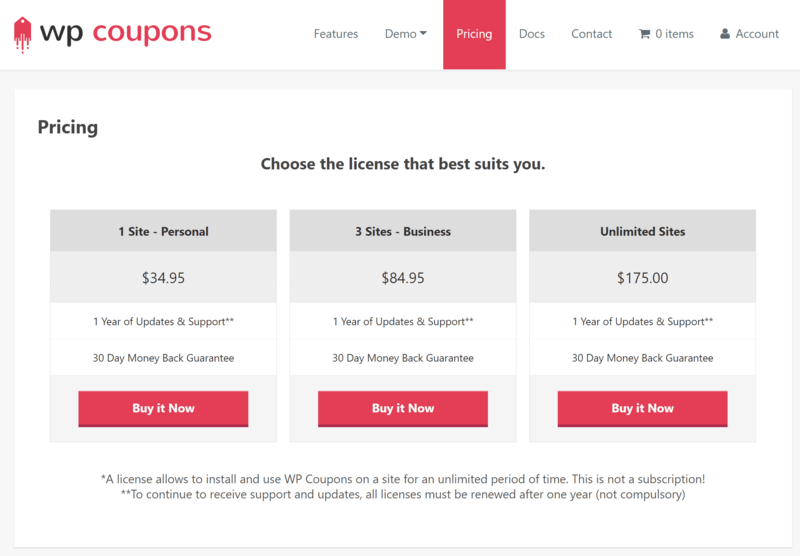 But a lot of you are probably selling licenses in which you might simply want one pricing page. We recommend using a plugin like Easy Pricing Tables. Once installed you can create a “Pricing” page on your WordPress site and use the shortcode from the plugin to display your pricing tables. You can then use custom Add to Cart links, along with the pricing tables to create a perfect shopping experience. Here is an example of one which uses the download ID along with variable pricing. 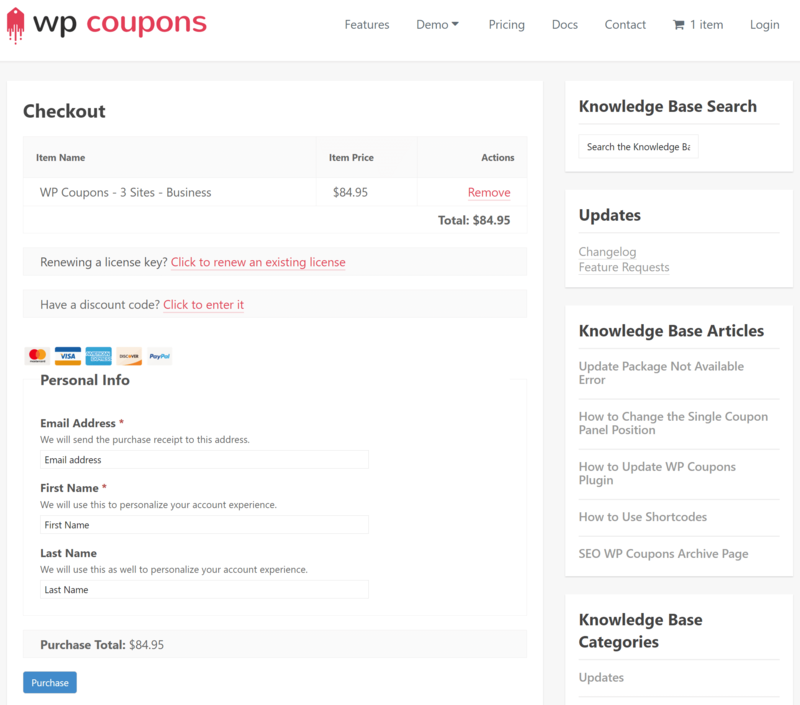 And here is an example of an EDD store pricing pages, along with custom add to cart links and variable prices. And that’s it! Your EDD store will automatically walk people through the checkout process using the pages it created during installation. It will generate an email to both you and the customer with their download file (and license key if applicable), and create a WordPress account for them to be able to log back in and access their past purchases. 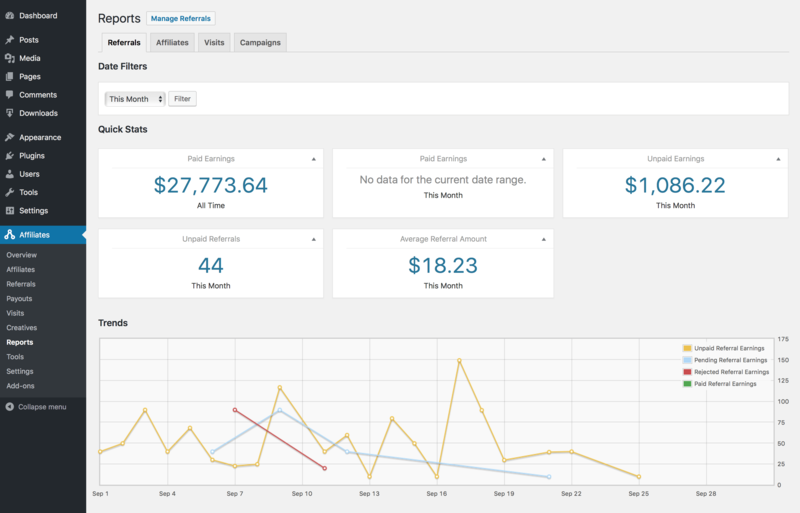 And don’t forget to check out the reporting data and payment history data. One nice thing too is that PayPal also talks back to EDD. So if you sell a product and they pay via PayPal, it will be marked as paid in EDD. Or if you later refund a product, it will automatically update EDD to show as refunded, as well as update your total earnings for that month. Want to create discount codes for Black Friday? No problem. Simply click on “Discount Codes” under Downloads and create as many coupons and discounts codes as you want. You can select a percentage off of your product or a flat rate amount. You can set an expiry date and even limit the use once per customer. Having a sale every now and then to pump up your product is super easy with EDD. You can further extend EDD with AffiliateWP, which is a premium product also created by the same team. This integrates so well together that you won’t even notice they are separate products. It lets you launch an affiliate program in just a matter of minutes. Start letting your customers sell your product for you. It provides all the information you need to pay your affiliates monthly and provide them their own discount codes in which they can give to their readers to help better sell your product. When creating a new digital business, it’s essential to choose the right online shopping platform. While using an existing third-party shopping platform like Etsy may seem like the easiest option, creating your own site is always the preferred method for those wanting to take it to the next level. That way you own and control the entire business, and you’ll be able to profit more in the long run. At the same time, however, you don’t want to have to spend hours on customer service or payment issues. That’s why it’s important to choose an e-commerce plugin that is both simple to navigate and reliable. Easy Digital Downloads stands out as a great WordPress e-commerce plugin for a few reasons. First, it’s free, and you can then extend it with premium extensions. Second, it’s reliable and has great performance. Finally, it’s easy to use and has a great support system and developer team backing it. All things considered, EDD is perfect for both novice and experienced WordPress users. If you’re in the market for a great WordPress e-commerce plugin, and want to try selling digital products from your website, the Easy Digital Downloads WordPress plugin is an affordable and effective option. We would love to hear your thoughts. Do you prefer WooCommerce or EDD?